Jazzy vocals with an R&B twist. 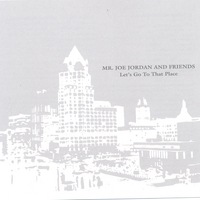 Mr. Joe Jordan & Friends/Let's Go To That Place was executive produced by Rodney L Washington and Nicholas Dillon. Washington is a professional lyricist, poet, and playwriter. He has written lyrics for 450 songs and is affiliated with music publisher Broadcast Music Inc., New York. Mr. Joe Jordan is a singer who displays an astonishing range of emotion and style that reflects the true essence of the performance. Mr. Joe Jordan has a background in theater and his mature song craft comes through the education of a diverse group of musical sources such as: Donny Hathaway, Marvin Gaye, and Nat King Cole, to name a few. This CD was created to showcase musicians and vocalists from the Milwaukee, Wisconsin metropolitan area. It features a number of smooth jazz compilations, including several originals, written by Washington, Dillon, and some of the 30 different musicians and vocalists who were involved in this project.